VERY DRUNK AT THE STATION.—On Thursday last, before T Hunter, Esq, Bernard Nutt, second air mechanic (R.F.C), Regent Street, London, was summoned for being drunk on the L & N-W Railway Station, at Rugby, on January 24th.—He pleaded guilty, and William S Laughton, ticket examiner, stated that the man was so intoxicated that a doctor was sent for, who, on account of his condition, ordered his removal to the Police Station for safety. Defendant travelled from London with an Australian soldier, who had a big bottle of whiskey.—Defendant informed the Magistrate that he was a teetotaller, and had only just come out of hospital. He had a little drop of whiskey, and that upset him.—Discharged on paying doctor’s fee, 5s. PRESENTATION.—On Saturday last an interesting presentation took place at the establishment of Mr J J McKinnell, Sheep Street, when Mr Horace Sanderson was the recipient of a very nice wristlet watch and a pair of silver vases. Mr J J Thompson, in making the presentation on behalf of his fellow-employees, spoke of the very efficient manner in which Mr Sanderson had discharged his duties during the 18 years that he had served as assistant and traveller, and felt sure that he would continue to serve as faithfully now he had responded to the call of his King and country. Mr Sanderson has also received a very useful letter wallet in recognition of his services as registrar at the Rugby Brotherhood, in which capacity he has done a good and faithful work. THE PARCELS sent on behalf of the Rugby Prisoners War Help Committee this week to local men in German prison camps contained : 1 large tin rations, 1 tin tripe, 10-oz tin sardines, ½-lb margarine, 1lb milk, 1lb rolled oats, 1lb cake, 1 tin fruit, ½-lb chocolate, ¼-lb tea, 30 cigarettes, ½-lb sugar, mustard. Capt R W Barnett, acting Brigade Major of a Naval Brigade, son of Mr Walter Barnett, of Bilton, has been awarded the Military Cross. Mr W W Peberdy, Lansdowne House, Rugby, has received intimation from the Admiralty that his son. Flight Sub-Lieut W H Peberdy, R.N, failed to return from a scouting flight in the East on the 14th inst. At present he is reported missing. LOCAL SOLDIER DECORATED BY KING PETER. Flight-Sergt A Forsyth, of the Royal Flying Corps, son of Mrs Forsyth, of 8 Murray Road, Rugby, has been decorated by the King of Serbia with the Silver Star in recognition of his distinguished services during the campaign in that country. Sergt Forsyth has since been promoted sergeant-major. He was for a number of years employed at the B.T.H Works, but at the time he enlisted he was assistant works manager at the Aluminium Works, Birmingham. NEW BILTON MAN WINS THE MILITARY MEDAL. Sergt George King, R.E, youngest son of Mr and Mr Tom King, 89 Lawford Road, New Bilton, and a native of the parish, has been awarded the Military Medal for devotion to duty with the Forces in France. When he joined the Army, Sergt King belonged to the Coventry City Police, but he is well known at New Bilton, and formerly played both for the Cricket and Football Clubs. His father has worked at the Portland Cement Works for 53 years, having served under five successive managers, and he has lived in his present home since the time of his wedding 43 years ago. MR J E COX’S SON SLIGHTLY WOUNDED. Information has been received this week by Mr J E Cox, of Lodge Farm, Long Lawford, that his son. Trooper G H Cox, of the Warwickshire Yeomanry, has been slightly wounded in the right thigh, and is in a General Hospital in Egypt. Another of Mr Cox’s sons (E E Cox) joined the 3rd Gloucesters last week. Mr Cox has now three sons serving in the Army. Much sympathy is felt for Mr and Mrs J Nicholas, of Lime Kiln Farm, who have received news that their eldest son, Lance-Corpl John Nicholas, of the Warwickshire Yeomanry, has again been wounded in the chest in action in Egypt ; also that their third son, Stewart, is officially reported wounded and missing since September 29th—the same day that his youngest brother, Percy, was wounded.—Trooper Alf Falconbridge, of the Warwickshire Yeomanry, who enlisted with Lance-Corpl Nicholas, has sustained a fractured arm. Mr and Mrs Reuben Banbrook have received the news that their son, Pte Bert Banbrook, has been badly wounded in the back and shoulder. He had not long returned to the front, having been previously wounded in the leg. He is one of five brothers upholding the honour of their country. He is now in hospital in France.—Pte J Ward, son of Mr and Mrs Thomas Ward, has also been home for the first time after his wounds. Unfortunately the poor fellow has completely lost the sight of an eye. Much sympathy is felt for Mr and Mrs Ward, who have already had one son killed. To the Editor of the Advertiser. SIR,—The Chancellor of the Exchequer has addressed an appeal to War Savings Committees throughout the country to assist in promoting the new War Loan. He suggests first that they should stimulate the purchase of War Savings Certificates during the next few weeks by all means in their power. But he also asks us, further, to extend our activities so as to include persons of moderate incomes to whom the plan of co-operative investment by means of War Savings Associations does not specially appeal, and particularly those who might be able to invest at once any sum between £5 and £50. Such people are often not familiar with the machinery of investment, and it is felt that in order to secure their help it is necessary not only to advertise the appeal to lend, but also to make available some means of obtaining information or advise, and especially assistance in filling up the necessary forms. For this purpose the Rugby Central War Savings Committee have, with the consent of the Rugby Urban District Council, established an Information Bureau in the Benn Buildings every day from 12.15-1.15, and from 7-9 o’clock ; also on Saturday afternoons. The Bureau will be opened on Monday next, Jan. 29th. The committee are also arranging a public meeting, to be held in the Temple Speech Room at 8 o’clock on Saturday, February 3rd, at which Major J L Baird, M.P, has promised to speak. The Schools and Boy Scouts are being asked to assist in the work of advertising. Other measures are in preparation by which we hope to make this national appeal so widely known and understood that no money which can possibly be lent to the Government will remain in Rugby uninvested on February 16th. To this end we ask with confidence for the help of all classes of our fellow-townsmen. Rugby War Savings Central Committee. WALDUCK.—In loving memory of our dear lad, ERN., who died of wounds in France, January 28, 1916.—Sadly missed by his loving MOTHER, FATHER, SISTERS and BROTHERS. WALDUCK.—In loving memory of my dear brother, ERN., who died of wounds in France, January 28, 1916.—Deeply mourned by MET. Thomas William Chater (known as Thomas) was born on 15th April 1896 and baptised at St Matthews Church, Rugby, on 24th February 1901. His parents were Charles Chater and Sarah Jane (nee Batchelor) who were married 18th June 1893 at St.Matthews. By 1901 the family had moved from Victoria Street, Bilton to 45 Pennington Street, Rugby and around 1913 the family moved to 7 Plowman Street Rugby. Charles Chater worked at the Gas Works. Thomas was the second of six children and in 1911, at the age of 14 was working as an errand boy for a bookseller. He enlisted early in the war in the 9th Battalion Royal Warwickshire Regiment. He missed most of the Gallipoli campaign arriving on 17th December 1915, shortly before the Division was evacuated to Mudros and then Egypt. They embarked for Basra from Suez arriving 28th February 1916 to defend British interests against the Turks. In late April 1916, British commander Sir Thomas Townsend surrended the garrison of approx 10,000 men at Kut-al- Amara, considered by many to be the greatest humiliation ever to befall the British Army. After reorganisation a new offensive against Kut was attempted. An attack was launched on the night of 13/14 December on both banks of the River Tigris. Around 50,000 men were involved in the advance. Progress was slow and it was not until 17th February 1917 that the Turks retreated from Kut. ANOTHER ST.MATTHEWS OLD BOY KILLED. Information has come to hand that Pte T.Chater, 9th Royal Warwickshire Reg. 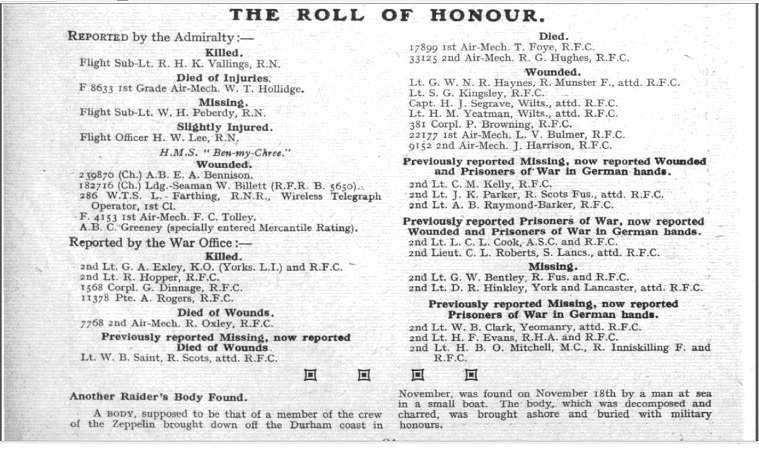 was killed in action on January 24th. Pte Chater, whose home was at 7 Plowman St. was an old scholar of St.Matthews School, and enlisted early in the war. Pte WILLIAM T CHATER R W Regt killed in Mesopotamia Jan 23rd 1917 aged 21 years. Also of Pte ARTHUR E CHATER M G C killed in France Oct 8th 1918 aged 20 years. Also of JOSEPH G CHATER who died Nov 5th 1918 aged 17 years sons of CHARLES & SARAH CHATER. Also of CHARLES husband of SARAH CHATER who died Oct 26th 1926 aged 56 years. footstone: ILMO SARAH JANE beloved wife of CHARLES CHATER who died July 9th 1951 aged 78 years. An 81 per cent wheaten loaf will come into existence by order of Lord Davenport, the Food Controller, on January 29.
mixed with oats, maize, barley, or rice up to that percentage. Wheat must be used only for seed and floor. No grain food must be given to pheasants or game birds. Sweet-making must be reduced by half. No chocolates may be sold dearer than 4s a lb, and no other sweets dearer than 2s 6d a lb. No sugar-covered or chocolate-covered cakes must be made. No milk must be used for milk chocolate before April 1st next. Export of oats from Ireland is prohibited. The wholesale price of 1916 potatoes (those now in use), will be £8 a ton—i.e, a shade less than [?] a pound. Prices are fixed for seed potatoes to plant now. Very soon Lord Devonport will issue Orders as to the control and distribution of bread, meat, sugar, and milk. All pig-keepers, notwithstanding the present high price of feeding stuffs, are urged to make every possible effort to maintain the supply of pigs. Sows with access to shelter will pick up a considerable part of the food they require out of doors. Where grass is scarce, a few swedes or mangolds, together with a pound or two of beans or finely-ground palm kernel cake, will serve to carry most sows through till farrowing time. For fattening pigs, 8 pounds of swedes, boiled, are equivalent to one pound of cereal meals or offals. Small or blemished potatoes are twice as valuable as swedes for feeding purposes ; but these should be reserved for the later stages of fattening. To supplement roots, the cheapest and most suitable foods at the present time are finely ground palm kernel cake, bean meal, maize gluten feed, and dried grain. Later on, clover, sainfoin, and lucerne, will be available in place of roots, and small holders should consider whether they can find space to add these to their crops. Edible domestic refuse should be reserved as far as possible for pig-feeding. The pig pail should be kept free from brine, lemons, corks, tins, wire, and other injurious substance. For fuller information and guidance the Board Leaflet No. 298, on Pig Keeping (free by poet on application), should be consulted. THE L & N.W & ALLOTMENTS.—The L & N.W Railway Company announce that they will consider applications for the use during the present emergency of vacant land both inside and outside the railway fences, subject to a short agreement and the payment of a nominal rent of 1s per annum. Applicants should address their inquires to the nearest station-master. LOCAL AID FOR ALLIES’ FARMERS.—According to the latest list issued by the Agricultural Relief of Allies Fund (16 Bedford Square, London, W.C) the central counties of England are credited with the following contributions to the fund :—Notts, £2,608 ; Shropshire, £2,581 ; Northants, £1,847 ; Warwickshire, £1,124 ; Leicestershire, £1,092 ; and Worcestershire, £189. PRESENTATION.—On Friday evening last week, at the Peacock Hotel, Mr F T Lambert was presented with a gold watch, suitably inscribed, by the soldier munition workers (numbering over 100) employed at Messrs Willans & Robinson’s Works, in recognition of services rendered. Gunner Townsend made the presentation, and the recipient suitably replied. The remainder of the evening was spent in harmony. Among those mentioned in Sir Douglas Haig’s despatches published was Lieut C H Shaw (Hussars), only son of Mr J F Shaw, of Bourton Hall. Lieut R C Herron, M.T, A.S.C, son of Mr R Herron, of Great Bowden, and formerly of Rugby, was among the list of names mentioned in Sir Douglas Haig’s recent despatch. Two more local men have recently fallen into the hands of the Germans. Private A Goodwin, of Rugby, 1st South Staffordshire Regiment, has been interned at Dulmen, and Private E Rollins, of Newton, Oxford & Bucks L.I., is interned at Wahn. In both cases Mr Barker has made arrangements for the men to receive the regulation food parcels. Goodwin will be “ adopted ” by his Regimental Care Committee and Rollins by the Rugby Committee. Lieut. Geoffery H. T. Wanstall, Dorset Regiment, brother of the Rev H C Wanstall, Vicar of Wollaston, Stourbridge, has been severely wounded in France, and is now in a Red Cross Hospital at Le Touquet. News was received from the War Office (Tuesday) morning that G H Cox, of the Warwickshire Yeomanry, son of Mr and Mrs J E Cox, of Lodge Farm, Lawford, was wounded in Egypt on January 9th. Further particulars are not known. News has been received at the B.T.H this week that Pte C B Crossby, of the 11th Royal Warwickshire Regiment, died on November 16th from wounds received whilst acting as a stretcher-bearer. Before the War Pte Crossby was employed in the Carbon Lamp Department. The Cemetery Committee had considered the question of setting apart a portion of the Burial Ground for the interment of Rugby soldiers dying through the war and brought home for interment. They recommended that, owing to the lack of room in the Cemetery, no portion be set apart for such interments, but that a selected grave be provided free in every case. THE REV. C. T. BERNARD McNULTY ON HIS ARMY EXPERIENCE. The Rev C T Bernard McNulty, vicar of Holy Trinity, Leamington, and formerly vicar of Dunchurch, has returned to his parish, after an absence of two years and a half at the front as Territorial Army Chaplain. Preaching on Sunday, he said that in the ranks there was real brotherhood. Men and officers were liable to the same fear, the same anxieties, and the same sorrows and the officers thought first of the men and the men first of the officers. This famous war film, for which Mr B Morris paying the largest fee ever paid by a Rugby Cinema proprietor, is being shown at the Empire this week and on Monday there were full “ houses ” at each show. The photographs were taken by Mr H D Girdwood, B.[?] F.R.G.S, geographer and historical photographer to the Indian Government, in many instances under hostile shell fire. The film gives a very vivid impression of life at the front, and of the excellent work which is being done by the gallant British regiments and their brothers-in-arms from India. English Lancers, Jacob’s Horse, Jodhpur Lancers, King’s Dragoon Guard, Gurkhas, Indian and English Artillery, are all shown together with the necessary but often underestimated work of the A.S.C and the R.A.M.C. Several actual incidents in the firing line are depicted, including capture of a German trench by the Gurkhas and the work of consolidating the position, which is shown to be not the simple process many have imagined. Another striking scene is a charge by the Leicesters, who are seen to fall in all directions, but who doggedly had their way through the barbed wire and capture the position. The film is accompanied by Mr Girdwood and his explanations of the incidents add greatly to the interest. Mr Morris has invited the soldiers at the local Red Cross Hospitals to visit the Empire free of charge, and arrangements have also been made for the children attending the Elementary Schools to see the film. Warner Hutchins Peberdy was born on 29 April 1884 in Rugby. The 1901 census shows Warner H Peberdy (aged 16) son of William W (born 1858 aged 43) and Annie Peberdy (also born 1858 aged 43) living in 22 Hill Street Rugby with siblings Ethel W (b 1882 aged 19) and Ruby A (b 1898 aged 3). On the 12th March 1909 Warner travelled from Liverpool to New York on the SS Baltic. He was shown as an Engineer from Rugby and his next of kin and home address were shown as WW Peberdy at Lansdowne House (which was in Hill Street) Rugby. Warner’s wife Catherine Annie Moss was born in the first quarter of 1884 in Rugby and she travelled on the SS Baltic from Liverpool on 23 October 1909 arriving in New York on 1 November 1909. They must have rushed to the registry office to get married on the same day! Warner and Catherine had a son, Victor Warner, born on 25 August 1911. In October 1916 Warner is listed in the UK, Navy Lists, 1888-1970 as Flt Sub Lieutenant in the Royal Flying Corps based at Eastchurch Kent. 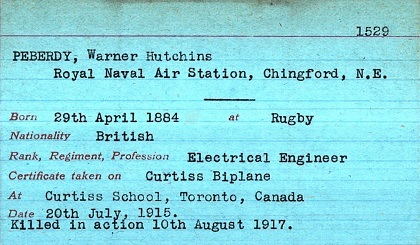 A Commonwealth War Graves notice of Flight Lieutenant Warner Hutchins Peberdy RNAS reports that he was accidentally drowned on 14 January 1917 aged 32. The England & Wales, National Probate Calendar states that Warner died 14 January 1917 in the Eastern Mediterranean and that he left £427 4s 9d to William Warner Peberdy carver and gilder and Charles Frederick Harris solicitor. However, an entry in the Birmingham Daily Mail on Saturday 25 August 1917 states: Lieutenant Warner Peberdy, R.F.C. 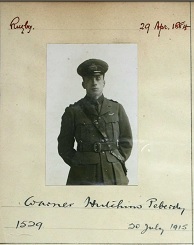 only son of Mr and Mrs W W Peberdy of Rugby, who failed to return from a scouting flight on January 14, is now presumed by the Army Council to have died on that date. He was last seen flying over the Belgian coast. Lieutenant Peberdy was an old Rugby Town School boy. He was in America at the time war broke out, and came to England in order to join the Royal Flying Corps. He was 31 years of age. Twenty-one Nieuport 11′s were delivered to the RNAS and these were operated by No 1 Wing at St-Pol in France and No 2 Wing in the Aegean during the ill-fated Dardanelles Campaign. Their British serial numbers were 3974 – 3994. The aircraft shown in this profile was delivered to the RNAS Depot at Dunkerque in late 1915 in complete French colours including the national markings, thus the overall finish was a clear dope or pale yellow. It was soon transferred to No 2 Wing and for a time it was flown by Flight Commander K S Savory and was known by the nickname of Bluebird. It was modified by having the refinement of metal fairings fitted behind the engine cowling. Both wings were painted blue on the upper surfaces as well as the nose and undercarriage. The aileron on the top right wing has been replaced and this is not blue but still clear-doped. Of special note is that the upper wing roundels remain the original French ones – ie with red outer circles and blue centres. The interplane struts and tailskid remain in their natural wood and metal colours. This aeroplane failed to return from a mission on January 14 1917 whilst being flown by Flight Lieutenant W H Peberdy. Apart from the Rugby Memorial Gates, Flight Lieutenant Warner Hutchins Peberdy RNAS is also commemorated on the Chatham Naval Memorial which remembers 8,514 sailors of the First World War. 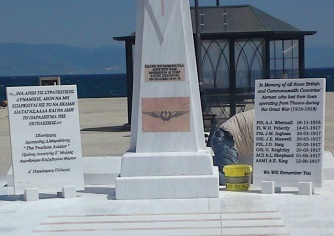 An interesting article entitled “Wreckage of a First World War Plane Found on Thassos” shows Warner Peberdy commemorated on a memorial in Skala Prinos where he was based at a British Airfield. News has been received at the B.T.H this week that Second Lieut J E Townsend, R.F.C, was killed while flying near Bristol on January 2nd. Lieut Townsend, who was, until the outbreak of war, employed in the tinsmith department at the B.T.H Works, enlisted in 1914 in the Worcester Regiment, and was subsequently granted a commission and transferred to the Royal Flying Corps. It was stated at the inquest, at which a verdict of accidental death was returned, that Lieut Townsend was under instruction, and had had sufficient experience to fly alone. He was navigating a machine, and Second Lieut Francis Bissicks, a trained pilot, accompanied him. There was nothing in the weather or engine conditions to explain the accident. The machine seemed to lose speed and nose-dive to the ground. Lieut Townsend was killed instantly, and his companion received injuries to which he succumbed at the Bristol Royal Infirmary. Sir Henry Horne, K.C.B, whose home is at East Haddon, Northants, has been promoted Lieutenant-General as a Now Year Honour. The Czar of Russia has also conferred on General Horne the Order of St Vladimir. “ No more men must be called from the land for military service under present circumstances.”-Mr Prothero’s instructions to Tribunals. Miss M Cook, of Holmby, Clifton Road, Rugby, has paid over £21 16s 9d from the whist drive held in the Co-operative Hall recently in aid of the Star and Garter Fund. An oak lining has been placed round one of the pillars of St Peter’s Church by Mrs Duncuff, in memory of her husband, L-Corpl A P Duncuff, who was killed in action in France on August 3rd, 1916. Captain (temporary Major) Eustace C Brierley, formerly of Rugby, has been awarded the D.S.O. Temporary Major Leonard Tate, of Swinford Lodge, was mentioned by Sir Douglas Haig in his despatches, and his name appeared in the list published on Jan 3rd. Second Lieut S E Rogers, of the Somerset L.I, formerly for some years in Rugby, was mentioned in Sir Douglas Haig’s recent despatch for gallant service in the Somme fighting. Temporary Major Henry Noel Hoare, A.S.C, was one of the recipients of the D.S.O in the New Year Honours list. When living in Rugby some years ago, he was well known as a very capable exponent of Rugby football (on the three-quarter line), hockey, and cricket, playing fairly regularly with the town clubs. Capt F S Neville, Northampton Regiment, is among the officers mentioned for special bravery in the field in the Commander-in-Chiefs recent despatches. Capt Neville, who was badly wounded early in the Somme Battle, is an Old Laurentian, and was a member of the staff of St Matthew’s Boys’ School when the War broke out. In his monthly letter in the Parish Magazine the Rector says :— Mr Dugdale has just written home to me to say that he has been appointed Chaplain to the 5th Army Infantry School for Officers and N.C.O.’s, and that he now has a chance of doing “ a permanent piece of work—that chance which one always longs for in a battalion and never gets.” He is anxious to start a regular Institute, with a reading room and a chapel in it. Amongst the Army Chaplains specially mentioned in Sir Douglas Haig’s despatch relating to operations on the Western front, appears the name of the Rev C T B McNulty, who is well known in Rugby and district. The reverend gentleman has been Vicar of Holy Trinity, Leamington, since 1912. Ordained in 1898, he served as Curate in Edgbaston Parish Church for two years. He left to become Curate of Holy Trinity. Coventry, and in 1905 was preferred the living of Dunchurch, and remained there for seven years. The first public sitting of the War Losses Commission for awarding compensation in respect of property taken over by the Government under the Defence of the Realm Regulations was held at Spencer House, St James, on Tuesday. The Commission, which was composed of Sir James Woodhouse (chairman), Mr E Shortt, K.C, and Sir Matthew Wallace, has already held over a hundred sittings in private. The prohibition of the Wool Sales at Rugby last summer formed the subject of an application by Messrs Cropper, Steward, and Cattell, auctioneers, of Rugby, who asked for compensation for loss sustained by reason of the prohibition of their wool sale by the Government. It was stated that the wool was gathered from the farmers in the district, and the sale had been extensively advertised for June 21. On June 8, however, a general order was made prohibiting dealings in wool, and the War Office telegraphed prohibiting the sale. The Chairman ruled that as the prohibition was in the nature of a general order affecting the whole of the United Kingdom, any loss which had been sustained by reason of such order was outside the warrant of the Commission. They were not authorised to grant compensation for losses sustained in common, and the claim was therefore barred. Mr Cattell urged that it was rather a hard case. The Chairman : We have a good many hard cases before us. We cannot act on sympathy. The firm were allowed their expenses. A similar application by Messrs Tait, Sons, and Pallant was dealt with in a like manner. GOVERNMENT SCHEME EXPLAINED AT BILTON. At a meeting of the Bilton Parish Council held in the Church House, Bilton, on Wednesday evening, representatives from several surrounding parishes attended for the purpose of debating the Board of Agriculture’s scheme for increasing the home production of food as plained by Miss Day, of the Board of Agriculture. Mr A E Warr (vice-chairman of the Parish Council) presided, and other members of the Council present were : Messrs F M Burton, J Veasey, A T Watson, G H Frost, and E J Smith. In addition there were also present : Mr Graham Patterson and Lady Rowenao Patterson (hom secretaries of the Rugby Sub-Committee of the County Agricultural Committee), Miss Day, Major and Mrs Neilson, Mrs Latouche, Miss Hastings, Mrs J Parnell, Mrs C Nickalls, Mrs P Nickalls, Mr and Mrs W Barnett, Miss Line, Capt Miller Rev W O Assheton, Mr H P Burdekin, and Mr C N Hoare. The Chairman read a letter of apology for absence from Mr M E T Wratislaw (Chairman of the Council), who was on military duty at the Coventry Tribunal, and he expressed the hope that the Council would give a favourable reception to the committee dealing with the Waste Land Scheme. Mr Graham Patterson explained that the representatives of Hillmorton, Dunchurch, and Bilton had taken the opportunity of attending that Council meeting, at the kind suggestion of Mr Wratislaw, to ask their advice and assistance in the scheme to bring into cultivation waste lands and vacant allotments there and in the adjoining villages. Time was pressing for the spring planting, and they begged the support of, and suggestions from, the Council to make the vacant plots prolific and productive. PROPOSALS OF THE BOARD OF AGRICULTURE. It was no use going wildly and madly into any scheme. The first thing to decide was how to bring in more land which was going out of cultivation ; secondly, to reclaim land which had gone out of cultivation during the last five years. This was all they would be able to do for the spring sowing. With regard to the autumn, they would have time to consider what pasture land it would be useful to plough up. If they were to do this work, she supposed the burning question of the moment was labour. Everyone was prepared to do the work if they could only get the labour. They all agreed, however, that the war had got to be won, and that Englishmen were required to win it. She had been asked by farmers in many cases whether they were going to lose the men they had now got. It was absolutely impossible for one to answer that question. It depended on how the war went on. If the Germans could retain Roumania till June, they would get the whole of the Roumanian wheat crop, which would certainly lengthen the war, and it was a question whether the Russians would be able to regain Roumania in that time. The whole matter rested on that. With regard to labour, the Government had at their disposal 10,000 German prisoners who had been employed in agriculture, and there were also large numbers of interned aliens, who were doing useful work. Where one or two men, or any number up to five men were required, she considered interned aliens were more useful the German prisoners, because they did not require a guard. Farmers simply had to apply to the Home Office for them and notify the police when they arrived. The aliens were not allowed to go more than five miles distant from where they lived, and if anything went wrong the farmer could notify the police, who would remove them. The farmer did not have to pay the fares for the men to come or go. They would be paid at the ordinary rates for unskilled labourers. There were also conscientious objectors, but she found that as a rule the farmers preferred aliens to these men. Then there were the women, who could do a certain amount of work, although she did not suggest that they could do the heavy land work. They were now making a stronger appeal than they had ever made before to the girls of the educated class. They were appealing to women who would, naturally, be taking up scholarships at the Universities. Men had given up their scholarships to join the army, and it was only fair that the women should put their scholarships aside for a year or two to help their country. A certain number of soldiers would also be available for the work. Then, too, machinery would be much more used than was the case in the past, and Mr Prothero, immediately on going to the Board of Agriculture, ordered a thousand motor tractors for the use of the War Agricultural Committees. Men were also being trained to drive them. Warwickshire had ordered some, and these would be ready about the third week in January. She thought there would be sufficient to do the work Required in the country. THE UTILISATION OF SMALL PLOTS. GOING TO BE A SHORTAGE. MOST PROFITABLE SYSTEM OF CULTIVATION. Miss Day suggested that where vacant plots were concerned, they should obtain expert opinion as to the value of cultivating them or not, so that no time should be wasted. With regard to the digging, she suggested that they should get the clergy or postmen and policemen to help them in their spare time. Digging was too heavy for the average woman. In the towns they could get a good deal of help from the volunteers. If they could not get the digging done in any village, they should refer the matter to the War Agricultural Committee. Machinery might be available for the larger plots. After the digging was done the women, properly organised, should be able to do the planting. She was very anxious that they should grow produce with a certain amount of common sense. She wished them to produce the same variety of vegetables as far as possible, because the Board would be prepared to market their surplus stock. They could not do this, however, if all the produce was of a different variety, because it had to be cooked in bulk. In order to do this, they might get some people who had sufficient ground to grow a number of seedlings for distribution at so much per score. Miss Day then advocated pig keeping, and said food could be produced more quickly in that way than by any other method. If it was not possible for one person to get enough food to keep a pig, they might have co-operative pigs. She believed if they once started a village piggery they would find it would grow very quickly. The school children should be enlisted to help in various ways, and Mr Prothero himself had approached the head of the Board of Education to try to get as much assistance from the schools as possible, and several counties had requested that the children should be allowed three half-days off per week, such absence to count as attendance if they were working in agriculture. The Board of Agriculture were going to stick at nothing in reason in order to get this food grown, and they were quite prepared to work, and to work hard, but it was quite impossible for the Board of Agriculture or any other Board to say that they should have anyone back who had gone into the army ; but where it was shown that there was a recognised shortage of skilled men they would try to get them back. The munition factories and mines were to be combed, and it was not proposed, as a general rule, to take any more men from agriculture. She quite understood the difficulty ; but it had to be faced, and it would not be satisfactory to the agricultural community of England to feel that an inconclusive peace had to be made, unless they felt that they had strained every nerve to get the food which was necessary for the country. In reply to Mr Barnett, Miss Day said the Government were considering the advisability of providing artificial manures.—Mr Hoare asked if they would fix the price of seed potatoes, and in connection with this Mr Follows read a letter from Mr Gordon Everitt, of the County War Agricultural Committee, asking the Parish Council to ascertain what seed potatoes were required in the parish. The County Committee would be able to supply these, but they did not know the prices or varieties yet. Not more than 5cwt would be sold to any one man, and the price would be less than £14 per ton. In reply to Mr Burdekin, Miss Day said where new land was ploughed up, expert advice as to the best crop to be grown could be obtained. Mr Watson asked if the restrictions as to pig keeping were to be relaxed, and Miss Day said she believed they were to be suspended, provided the pigs were kept clean and to the satisfaction of the sanitary inspector. In answer to Mr Fellows, it was stated that two men were sent out with the motor tractor.—Major Neilson : Is the ploughing done free, or do people have to pay ?— Miss Day : A charge of so much per acre is made. Mr Warr assured Miss Day that the Council would do all they could to further the scheme.—It was decided to elect a committee of seven, three of whom should represent the Parish Council. Those elected from the village were Messrs J E Cox, H P Burdekin, W Barnett, and T Smith. The Parish Council representatives chosen were Messrs M E T Wratislaw, E J Smith, and A J Askew, with Mr J J Cripps in reserve in case either of these failed to serve. RUGBY OFFICER GAINS THE MILITARY CROSS. Capt H H Neeves, of the Northumberland Fusiliers, elder son of Mr and Mrs S Neeves, “ Langdal,” Murray Road, Rugby, has been awarded the Military Cross for bravery in the fighting on the Somme during July last. Capt Neeves was at the same time promoted to his present rank. In the early days of the War the gallant young officer, who had been on the staff at Rugby Post Office, went out to the Dardanelles as a corporal in the Warwickshire Yeomanry, and took part in the landing at Suvla Bay. He was afterwards invalided home, suffering from the effects of dysentery ; and then, securing a commission, he was attached as a second lieutenant to the Northumberland Fusiliers, and went out to France in June. The gratification at his quick promotion and the honour he has won will be shared by his many friends and acquaintances in Rugby and district. Sergt A E Dodd, Leicestershire Regiment, one of the earliest recruits from the B.T.H Works, is in hospital at Ipswich suffering from wounds. Sergt Dodd has been wounded three times—at Monchy, Guillemont, and Combles, The last time he received four different wounds at once, and has undergone 14 operations. Before the War he was employed in the B.T.H Wiring Department. Dr and Mrs Relton, of Rugby, have received intimation that their son, Second-Lieut B C Relton, of the Warwickshire Regiment, has been wounded. Before the War he showed promise as a footballer, he having played half-back both for Rugby School and the Town Club. As a cricketer, too, he gained his colours in the School XI., and later on assisted the Rugby Club, being a very useful fast bowler. DEATH OF PTE TIMMS.—Mr Wm Timms, of Bretford, has received the sad news that his brother has succumbed to wounds in Rouen Hospital. He was injured rather dangerously in France, but it was thought at one time he would recover. He belonged to the Middlesex Regiment. Before joining the Colours he was employed on the railway dining cars. Mr Timms has another brother in the 2nd Leinsters, who has been on foreign service for a long time. Much sympathy is felt for the relatives. Lieut Wilfred H Parker, son of the Hon E W Parker, Westfeild House, Rugby, has been awarded the Military Cross for distinguished service in the field. From “ London Gazette ” of Monday, January 1st :—Gordon Highlanders, Sec Lt F Hunter resigns his commission on account of ill-health contracted on active service. Capt R N O’Connor, of the Scottish Rifles, son of Mrs O’Connor, Overslade Manor, Rugby, has been mentioned in despatches by Sir Douglas Haig. This is the third time Capt O’Connor, who has already gained the Military Cross, has been mentioned in despatches, and he has recently been gazetted Brevet-Major. The parcels sent this week on behalf of the Rugby Prisoners of War Help Committee to the local men in prison camps in Germany contained: ½-lb sugar, ½-lb milk, 1 tin herrings, ½-lb dripping in tin, ½ lb biscuits, 1 tin oxo cubes, 2ozs tobacco, pepper, salt, mustard, ½-lb cooked ham in tin, ¼-lb tin of cocoa, 1 tin sausages. COUNTY COUNCIL CLERK’S SON HONOURED. In Tuesday’s honours list is the name of Second-Lieut (temp Lieut) Edward Hubert Field, R.F.A, who has been awarded the Military Cross. He is the son of Mr Edward Field, clerk of the Peace for Warwickshire and clerk to the County Council. Temporary Lieutenant-Colonel H J Nutt, Royal Warwickshire Regiment, who commands a Coventry Territorial Battalion, and has been associated with the Territorial Force for many years. Temporary Major A Welch, Royal Warwickshire Regiment, who has already been decorated for his services as a Volunteer officer. He is serving with a Territorial Battalion, and was promoted to the rank of Major in October, 1914. NEW RED CROSS HOSPITAL OPENED AT RUGBY. The new Red Cross Hospital at the Rugby Union Infirmary was opened on Monday, when thirty wounded soldiers arrived from the First Southern Hospital, Birmingham. There was no formal opening, but on Friday the hospital and staff were inspected by General Quayle Jones, the Countess of Denbigh, and Mr E K Little, County Director of the Warwickshire British Red Cross. General satisfaction was expressed at the admirable equipment, etc. Mrs Brooke Michell, Vice-President of the Rugby V.A.D, was also present at the inspection. The building, which was built for an infirmary, is a very commodious one, and admirably adapted for its present uses. It has accommodation for sixty men. There are three large wards, each capable of containing 18 beds, and two smaller ones. There is a surgical room, but not an operating theatre, and minor operations are performed in the wards. There is also a spacious day and recreation room. The staff is provided by Warwick 40 and Warwick 66 V.A.D, and the principals are :—Mrs H P Burdekin, commandant ; Miss M Townsend, assistant commandant ; Mrs C O Wharton, quartermaster ; Miss Townsend, assistant quartermaster. Mrs Thomas, who has worked at Te Hira for the past twelve months, is the matron, and the trained sister is Sister Gordon. Dr Crooks and Dr Wardrop comprise the medical staff. The hospital staff is receiving instructions in fire drill, in order that they may be prepared for any eventuality. Visitors desirous of visiting the Hospital will be welcomed on Wednesday afternoons. Some of the many social changes which have been foreshadowed during the last few weeks came into operation with the New Year. The most noticeable changes were those affecting railway travel. Monday was the first day of the new order resulting in fewer and slower trains and a general increase of 50 per cent, in fares. The baking of standard bread also became general in accordance with the new Order. A separate Food Production Department has been set up at the Board of Agriculture to organise schemes for increasing the home-grown food supplies. It is understood rather under 10,000 German prisoners are available for work on the land. There is still too much evasion of the drink control regulations in some quarters, and the need of more stringent penalties for offences is under discussion. An Order was issued on Tuesday making it illegal to sell spirits unless reduced to 30 per cent. under proof, and a further reduction to 50 per cent. under proof is permissible. Held on Friday (Dec 29) at St Mary’s Hall, Coventry. Present : Messrs M K Pridmore (chairman), H W Wale, S J Dicksee, and K Rotherham. Military representative : Mr M E T Wratislaw. Agricultural representative : Mr F W Channing. Before taking the Rugby cases the Chairman welcomed Mr Dicksee on behalf of the Tribunal. He said they felt from the first they were very much handicapped with the Rugby cases because they had no Rugby representative. It was not the fault of the Tribunal, because they strove very hard to get a Rugby representative, but could not find anybody to act ; but when the numbers were extended they asked for one, and were very pleased to have Mr Dicksee with them.—Mr Harold Eaden also offered a welcome to Mr Dicksee, and said he was sure his assistance would be of value to the Tribunal. ALLEGED “ NOTORIOUS POACHER ” AS A SUBSTITUTE. The substitute offered by the Military to John Smith Cockerill, Pailton, for his son, Thos John Cockerill (20, single), was described by Mr Harold Eaden, representing the farmer in question, as “ a notorious poacher in the district.” He added that on the first two days the man was ill, and when he presented himself on the third day and was called upon to do the ordinary work, for which he was there—that of a cowman and stockman—he could not milk a cow and understood nothing about stock. Mr Cockerill tolerated him for two days, but at the end of the fourth day gave him his week’s money. The Military seemed to have offered a substitute without satisfying themselves that he could do the work- They must send a man who could do the work, and not a man whose principal qualification was poaching. Mr Wratislaw contradicted the statement that the substitution officer did not satisfy himself as to the man he was sending. Mr Livingston (who had tried the substitute) said he was a most capable man and a very willing worker. Mr John Harrison, of Pailton, described him, as “ a capable farm labourer and willing worker,” adding : “ I have employed him several times, and have always been satisfied with him ” ; whilst Mr Davy, who had also had the man in his employ, said if he had a man of Military age for whom he required a substitute he was exactly the man he would wish for. The man said he did some thatching and milked, and worked out the full week ; and, in the opinion of the local Tribunal, until young Cockerill was taken away his father was not going to have a substitute. Mr Eadon replied that Mr Cockerill was quite willing to let his son go if a reasonable substitute could be found.-The Chairman : This man does seem to be reasonable.—Mr Cockerill said it took the man half-an-hour to milk a cow, and he sat down on the wrong of the animal to milk her (laughter). He said he had never milked a cow in his life. Mr Wale said he did not see any reason why an advocate should come into that Court and suggest that a substitute, whatever his previous character had been, was a poacher. He objected to that.—Mr Eaden said the man might be a very good labourer, but he was useless to Mr Cockerill, particularly in the winter. The Chairman said in a case like this the man ought not to have been dismissed ; the employer should have first communicated with the Military. Mr Eaden : If the man was no good the Military could not make him any good.—The Chairman : You know the whole point is : These men have got their sons, and do not want to part with them. They will take no substitute if they can help it. The appeal was dismissed, and Mr Eaden said his client would try and find a substitute independently of the Military Authorities. Mr Eadon asked for his client to be allowed 28 days, but Mr Wratislaw objected, and it was not granted. Chas Oakes, Kirby Lane Farm, Monks Kirby, appealed for Edwin Lowe, cowman and farm labourer, Monks Kirby.—Mr Wratislaw stated that conditional exemption was granted to Lowe whilst in the employ of Mr S Hodgetts, but the man left that employ, and the Monks Kirby Tribunal upheld the view that Mr Oakes could not possibly appeal for him.—Mr Wale : certainly he could. He claims as the employer. It does not mean that a man is to be bound for ever to that particular employer. You are creating slavery.—The Chairman said the Tribunal had to decide that the was in order ; and then, according to the new Army Regulations, adjourn the case sine die.—This course was adopted.—The Chairman (to Mr Wratislaw) : You had better pass on the poacher.—Mr Eaden : We do not want him again. The appeals for John Bryson, stockman and shepherd, Manor Farm, The Grange, Wolston, and Geo Wilson, wagoner. Gate Farm, Bourton, were also adjourned sine die. Mr Worthington represented Ernest Jinks, grocer, clothier, and beer retailer, 104 Cambridge Street, Rugby, who asked for leave to appeal for an extension of the temporary exemption, to January 1st.-The appeal had been made on the ground of domestic hardship ; and Mr Worthington said the man had four young children.—The Chairman said they knew the position very well. They could not make a practice of granting leave to appeal, or they would have everybody coming back and asking for leave. There must be further facts.-The application was refused.—Appellant : Give me time to clear my stuff off ?—The Chairman : No ; there is no more. With respect to the appeal for Francis John Bucknill farmer and wagoner, Marton, Mr Wratislaw said they had effected a substitute, and Mr Bucknill, sen, expressed himself as satisfied, it transpired that a man from Broadwell, who had been passed in a low category was the substitute, and Mr Bucknill said his son was going into the Army on the following Monday.—The Chairman : I think you ought to be congratulated on the course you have taken. WHEELWRIGHTS WANTED IN THE ARMY. The case of John George Bennett, wheelwright, &c, 7 Gladstone Street, New Bilton, in the employ of Mr F Sharpe, of Rugby, had been adjourned for enquiries to be made to see if the man could still be enlisted in his trade, and Mr Wratislaw said their information was that the Royal Engineers were appealing for wheelwrights.-The employer’s appeal was, therefore, dismissed. The Home and Colonial Stores, Ltd, appealed for their Rugby manager, Alfred Wm Elsley, 70 King Edward Road, paused for garrison duty abroad.—Mr Wratislaw said the man was not in a certified occupation, because he was not a manager in the strict sense of the word. Whatever he required for the shop was supplied from the head office.—Mr Sharman, who represented the firm, said that point had been decided in their favour by the Central Tribunal.—Mr Wratislaw : You do not handle big sides of bacon, do you ?—Mr Sharman : We have 2½ cwts of sugar to handle.—The Chairman : You are very lucky.—Given till May 1st. ANXIOUS TO DO WAR WORK. An appeal as a skilled man who wished to be placed on war work was made by Wm Thos Scrawley (28, married), general fitter, 15 James Street, Rugby.—The appeal was at first dismissed, the Chairman remarking that the man would be very useful in the Army ; but appellant then produced documentary evidence that he was badged ; and the Chairman remarked that the Military could not touch him ; and Mr Wale advised applicant, in his own interests, to get into a controlled establishment. BUILDER’S APPEAL FOR AN ELECTRICIAN. Messrs Linnell & Son, builders, Rugby, appealed (through Mr Worthington) for Horace Walter Gilbert, electrician, 56 New Street, New Bilton.—It was pointed out that this was the only man left in the electrical, department, and his going would mean closing the department, which had taken seven years to build up, and this would be a most serious financial loss to the firm.-Mr Wratislaw said Mr Linnell, jun. had gone into the Army ; and in the circumstances Col Johnstone suggested that Gilbert might remain till March 31st.—This course was approved. The Military appealed against the exemption that had been granted to George Mascord White (22, single), shoeing and general smith, Dunchurch, in the employ of his father.—Mr Wratislaw said they offered as a substitute a man named Loydall, of Long Lawford.—The Chairman informed Mr White, sen, that he could not keep a young man of 22, passed for general service, and told him he had better “ collar on ” to the substitute, and consider himself lucky.—Mr White said he was afraid the substitute named would not suit him, and asked for a month or two to try him, as he had very valuable horses to shoe.—The Chairman said they could not keep a young man of 22 back to shoe valuable horses, and the Military appeal was upheld. “ All the pipes in the parish are burst,” said Mr Eaden, adding that it was an opportune moment for the appeal of Wm Walter Heap, (37, married), builder, plumber, and undertaker, Dunchurch.-The Tribunal offered till March 1st.-Mr Eaden said he should want to ask for further time. Mr Wale : You must pray for the frost to continue.-March 1st. Edwin Edwards, carter, &c, appealed for his son, Wm Edwards (24, married, and passed for general service), 56 Railway Terrace, Rugby, engaged in the delivery of parcels and helping in the business.-Mr Eaden said a substitute was offered, but when he looked at the job he admitted he was not strong enough for it.—Mr Wratislaw said the substitute refused the job because the wages offered were only 25s a week.-Mr Edwards : He said he would sooner put khaki on.—Mr Wale : I should say so. He would be better off.-The Chairman said it could not be suggested that the work was of high national importance.-Appeal dismissed. A POSITION OF A FOREMAN BAKER. An appeal by the Military was made with respect to George Brown (37, single), foreman baker, 32 James Street, Rugby, on the ground that, although the man was in a certified occupation, he spent only six hours a day in bread baking, and the other part in confectionery.—The employer said he used five sacks of flour a week for broad, and he was also under a contract to supply cake to the Military.—March 1st. There were unusual circumstances connected with the case of John Frederick Woodford, slaughterman and butcher, 82 Craven Road, Rugby.—Mr Wratislaw said the Master Butchers met the Advisory Committee extremely fairly, and until they could substitute Woodford they thought he ought to stay ; but the moment they got a substitute the master butcher employing the man offered to release him for general service. They found a substitute, but when the case came before the Rugby Tribunal, who had given a certificate of exemption, they promptly refused to go into the matter, and said they would not interfere with their previous decision.—Mr Nelson (clerk to the Tribunal) said he had a letter from Mr Smith, the man’s employer, stating that he was quite prepared to assent to the question raised by the Military.—Appeal allowed. An application by Ernest Shepherd (38, married), Clifton Inn, Rugby, for a munitions order to enable him to keep his business together was opposed by Mr Wratislaw, who contended that the father, aged 75, who previously held the license, was quite capable of supervision.—Mr Worthington represented appellant, who was given till January 28th. HORSE TRAINING FOR 23/- A WEEK. John E Wilkins, horse trainer, Bretford, appealed for Arthur Edwin Taylor (28, married), assistant horse trainer and farm hand, stating that it was necessary in his business to have a young man used to the work, as a good many of the horses sent to be trained were spoilt, and of bad character.—Mr Wratislaw : It is rather a dangerous job.—A : Yes.—Mr Wratislaw : And for that risk and skill you only pay 23s a week, without a cottage ?—Mr Wilkins replied that he paid more than most of the farmers in the neighbourhood, and the man had a garden in which to grow potatoes and other vegetables. He would give him more wages if he stayed. Mr Wale : I do not think 23s a week constitutes indispensability.-Mr Wratislaw : Do you consider for a man to whom you pay that wage it is in the national interest he should be retained ?-Mr Wilkins : I am paying a good deal more than my father used to pay.—Mr Wratislaw : We say it is not in the national interest the man should be retained.—Applicant : Is is not in the national interest that horses should be trained ? Could not you find me a substitute ?—The Chairman : Not at 23s a week. They are not to be had.—Applicant : What wages do you think I ought to pay ?—The Chairman : That is for yourself to decide.-Appeal dismissed. A long letter was put in by Chas Barfoot (33, married), joint smallholder and carrier, Birdingbury, in support of his application.—He was given till March 31st, with the hint that he had better be ready to join up by then. On the understanding that he helped a neighbouring farmer, who last week met with an accident, breaking his leg on the ice, Sidney Strong, farmer and wharf manager, Royal Oak Inn, Hillmorton Wharf, was given a temporary exemption till March 31st.